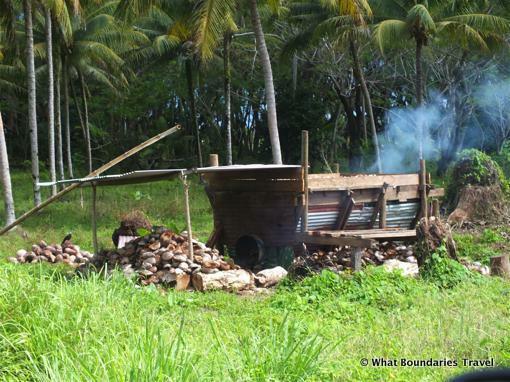 As we drove around Fiji we often saw these copra kilns. For many people, and especially in the Fijian villages, the production of Copra is a primary source of income. With the coconut trees so prevalent across the island you can see why it is a popular activity. Making copra is not an easy task. Coconuts are gathered and then cut open and halved. The coconut meat is then dried – most often using a kiln shown above. Many locals who use the kiln will bring the dried product to the copra mill for final production. When the copra production is completed, the main product will be coconut oil extract – about 70% of the copra will be used for this. The remaining 30% by product is called copra meal and is typically used as feed for animals.